We at the World Championship of Ping Pong are continually looking to expand our brand and global reach. One of our primary mechanisms to achieve this will be global franchises. The purpose of these franchises will not only be to expand the reach of ping-pong, but to feed the best talent each country has to offer to the World Championship of Ping Pong. The winner of the WCPP’s United Kingdom franchise, for example, will go on to represent the United Kingdom in the main tournament. · Gross sponsorship/advertising sales for events held within the United Kingdom. The following English players are some of the nations best. The UK Master Franchisor should personally invite the most talented players in his or her country to participate. 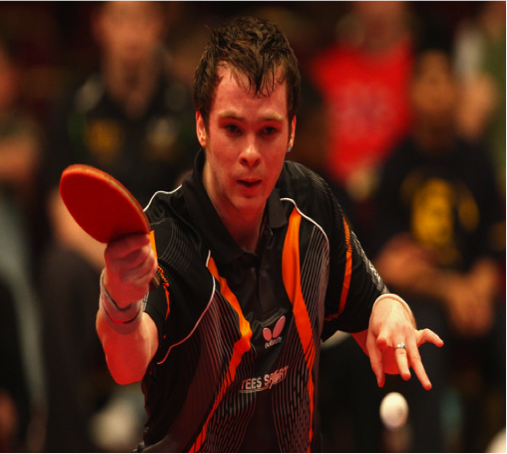 Paul Drinkhall has been the premier of British ping pong since he was 16 years old. In 2007, he defeated experienced champion Alex Perry by a score of 4-1 to capture England’s top spot. Drinkhall generates incredible power and is often cited as having the most powerful forehand outside of Asia, which is manifested with his patented “inside-out forehand to backhand smack-back.” At only 21 years old, in a sport when one’s prime is usually around 26, Drinkhall plans to improve his #127 ranking as his experience grows. Andrew Baggaley is the UK’s second ranked player at #155 in the world. Baggaley originally gained his notoriety as England’s top junior, winning 23 national junior titles. Baggaley has gained a reputation for upsetting players well beyond his level, most notably, Peter Karlsson and Chiang Peng-lung. He also has served as the table tennis motion capture actor for Xbox 360 game Kinect Sports. If you are interested in owning the United Kingdom Franchise, or wish to inquire about other international franchise opportunities, please contact Bryan Ciambella at bciambella@liquidityworks.com or call him at 212-953-3000.